I had seen one before on the Dee Estuary when we had come on it by accident, not knowing what it was and were just stupified by the magnificence of it all as the swirling masses changed shape and shade and finally spiralled down into the reed beds beside the river. This was different, by now I knew the theory, had seen it so often on television, and thought that I knew what to expect and where and when and we were there in plenty of time having been volunteered the information that “it would be between five and five thirty at the pier,” when I had wondered into tourist information with binoculars round my neck. We still did not know where was the best place to view or quite what to expect. At eight minutes past five we felt slightly underwhelmed when a small group of about twenty starlings put in an appearance. I think we expected to see them flying over the sea, and the first surprise was that they seemed to be circling over the town. 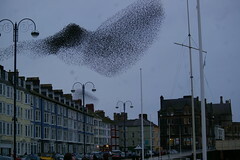 Over the next forty minutes they were joined by groups of starlings that appeared from all directions, some in tens and some in hundreds and possibly some in thousands and for so much of the time they just appeared as huge and growing numbers of birds flying around. I have no idea how many birds were involved: only that the numbers were obviously vast. Then the mass shapes started to appear and camera shutters clicked repeatedly as the evening performance continued. The sky was darkened by the clouds of birds. At one time part of the flock passed directly overhead and it was as if there was a ceiling of starlings above our heads. I just said “the flock” but it seemed as if there were several flocks which crossed and merged and separated and swirled first together and then apart. Then came the moment which at any rate I had been waiting for when the flock, the mass, the murmuration came out of the sky: on the estuary I said it had spiralled down, not quite the word I would use here but never the less somehow they did funnel down from the sky into the area under the pier…as we walked towards the pier to see what was happening from closer range, we could see birds silhouetted against the sea and the sky which showed through the structure of supports under the pier as they settled on beams and spars and what appeared possibly to be extra perching areas left there by some kind engineer. We watched as groups of birds, twenty, thirty maybe hundreds strong even, dropped down the side of the pier and disappeared beneath it. As we got closer still the chorus swelled, the like of which I had never heard before and may well never hear again. By six the aeronautics were all over and the sun had set and some of us had experienced wonder in a new way.